With the continually changing business market, sign removal has become an emerging business need. Attempting to remove your building’s signage yourself can be a difficult task and can lead to damage. It’s important to have trained professionals perform the job correctly as they have the necessary tools and equipment. Testa and Sons understand the preparations involved for sign removal as an ongoing business need. Signs pose as a marketing tool for your business, and physical signs need to be properly replaced periodically. Depending on the season or promotion, signage can be changed to fit your business needs. At Testa and Sons, we safely and professionally remove business signage. 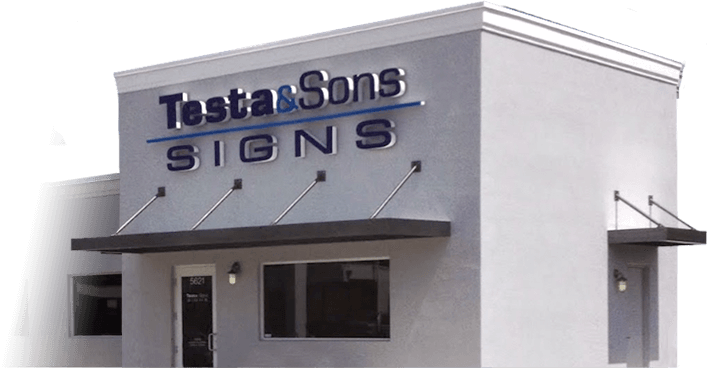 Regardless of the size sign, Testa and Sons have a wide variety of signs readily available in whatever size you may require. We ensure the removal of your business signage is seamless and professional. Your storefront or business may have the previous occupants business name on the exterior, which can cause confusion for clients. Also, your business may have a new logo design, but your business has the previous logo installed. Additionally, you may need a new sign type for your business promotion and it requires the removal of the current sign. Whatever your sign removal needs, it’s beneficial to have them safely removed before installing new signage. That’s why sign removal is beneficial to your business. Why Testa and Sons Sign Removal? Testa and Sons have serviced businesses all along south Florida from Miami to Fort Lauderdale and Palm Beach. With over 40 years of experience, we have removed and installed signs of all varieties. Our service professionals are fully licensed and certified to remove electrical and non-electrical signs. If you are in need of sign removal and new installation, contact Testa and Sons today for a quote.